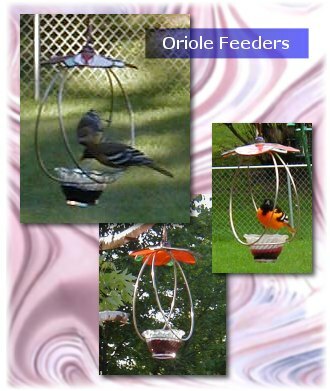 These colorful oriole feeders have no trouble attracting orioles! The glass roof is a 6" bright orange "flower" and sits on 8" rings that hold the jelly cup. The cup is easily removed for cleaning and refilling with their favorite food: grape jelly! For a special treat, try replacing the cup with a piece of fruit. You'll spend hours watching their antics around the feeder, and delight when the adults bring their fledglings to it. I've had adults with 5 babies trying to eat all the jelly at once! Quite a sight.